If you are looking for outdoor wedding venues for a sunny ceremony and an everlasting memory, you’ve come to the right place. Whether you say your vows in a quaint English country garden or you want to pitch a tipi for your reception, these top wedding venues at Bridebook.co.uk have the most amazing outdoor spaces! 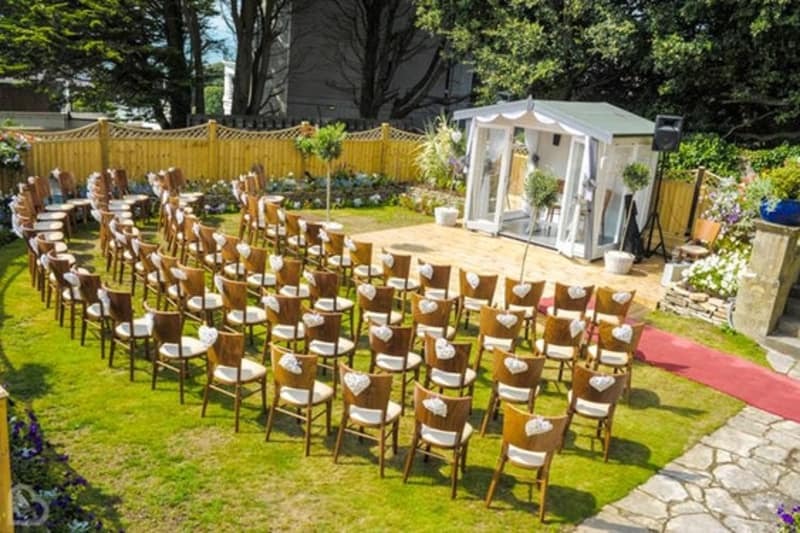 And if none of these venues is for you, start your own Wedding Venue Search and select the style filter ‘outdoor space’. Enjoy! Gorgeous terraces, a maze of gardens and the perfect lawn can be found at The Lost Orangery. Feast on a picnic using the beautiful outdoor space here, or go for a summery boho vibe with a celebration in a luxury marquee. Your wedding photos will be completely out of this world! 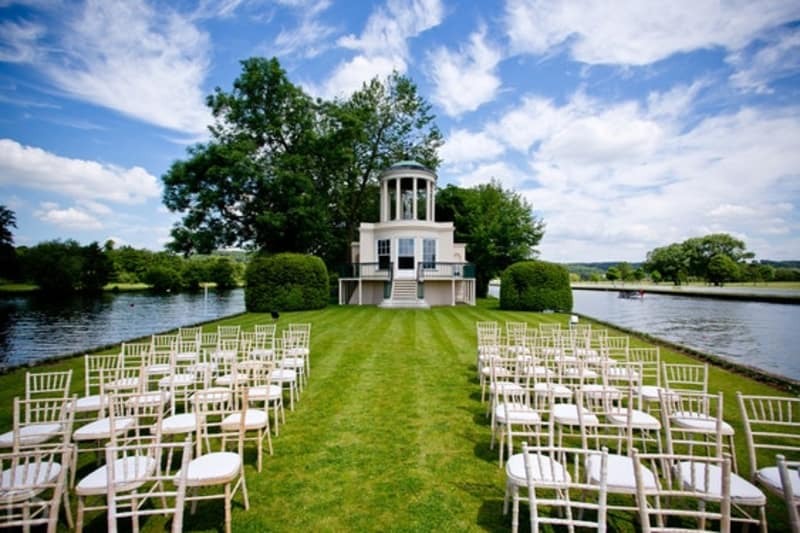 On one of the most magnificent stretches of the River Thames, you could have your very own island for your wedding day. Temple Island offers incredible riverside lawns, access by boat, and of course the statement Temple structure. 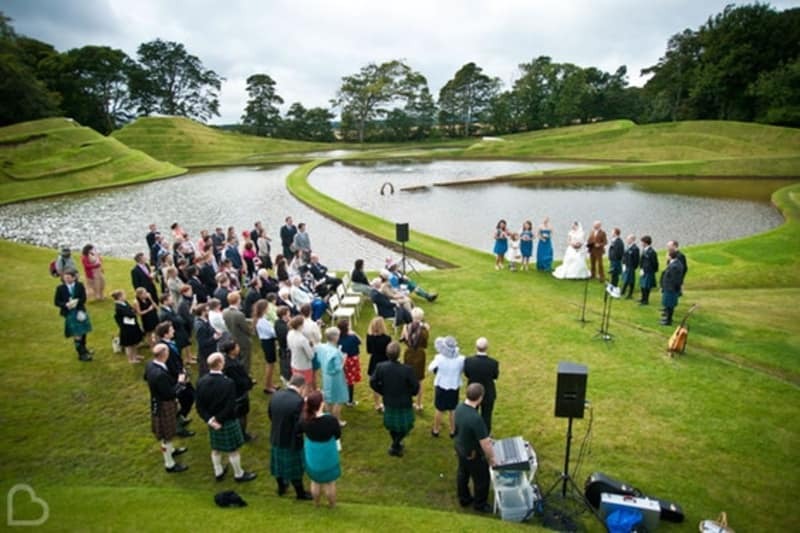 What more could you want for a memorable outside wedding venue? This Victorian Pleasure Garden dates back to 1880, made up of a central main lawn and surrounded by quirky and characterful buildings. Sip on Pimms during the summer months and warm up with mulled wine in cooler months at Larmer Tree Gardens, besides free-roaming peacocks in this English Country setting. 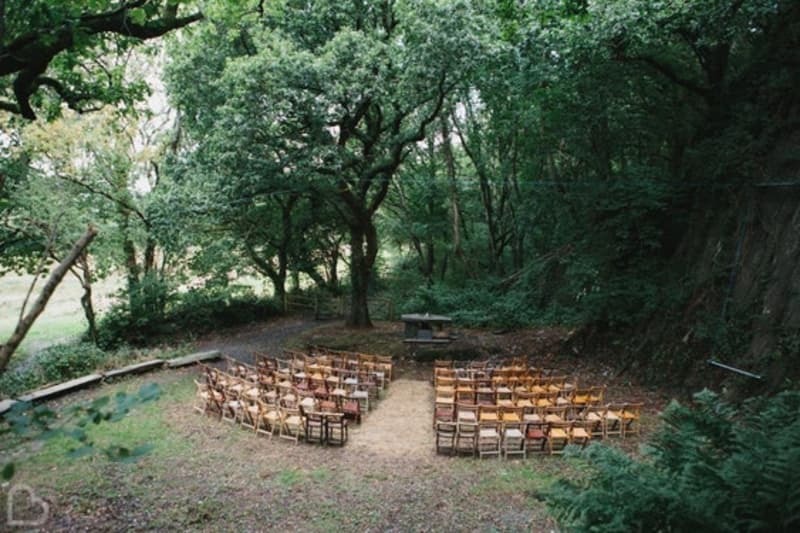 Are you after a simple, rustic ceremony in a natural outdoor wedding venue? Fforest is a 200-acre farm that can be all yours for an entire weekend, surrounded by woodland, river views and unspoiled beauty. With on-site tipis, a small pub, and even a secret sauna, you’ll have the best time exploring the land here! 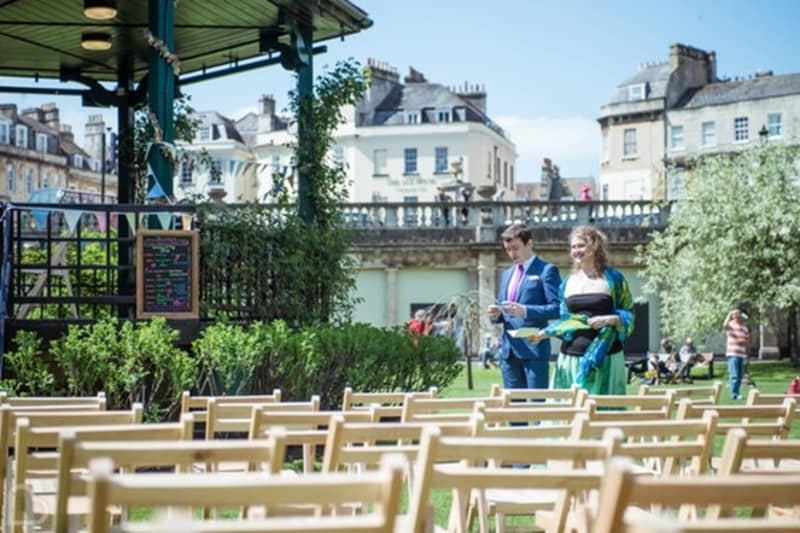 3 local unique venues are up for grabs at Weddings in Heritage Parks – Bath Botanical Gardens; The Temple of Minerva; and The Royal Victoria Park Bandstand. All as wonderful as each other, these oasis venues are just the perfect setting for an outdoor celebration. As you step through the traditional Coach House and across the cobbled courtyard, you’ll discover the beautiful walled Victorian garden. Watch the sun shine down on ancient fruit trees while you say your vows in The Secret Garden, a hidden gem in the Kent countryside. 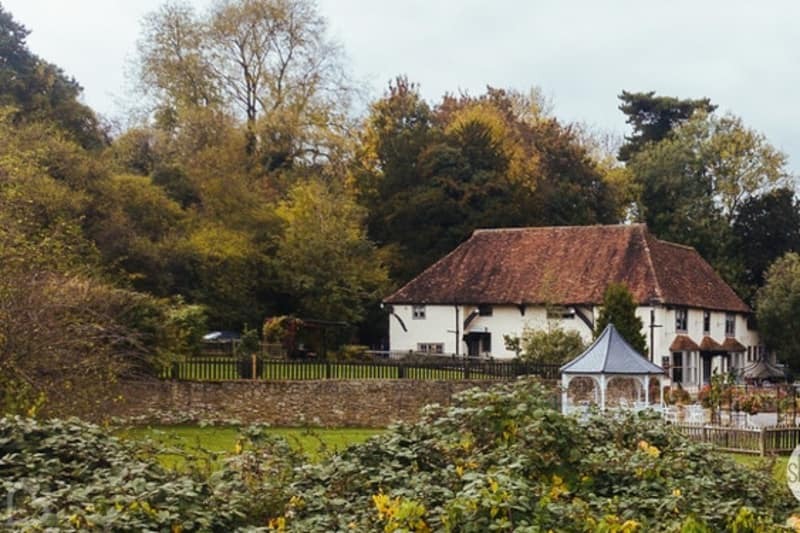 Set in 20 acres of countryside landscapes, Lodge Farm House can be the answer to all your outdoor wedding questions. 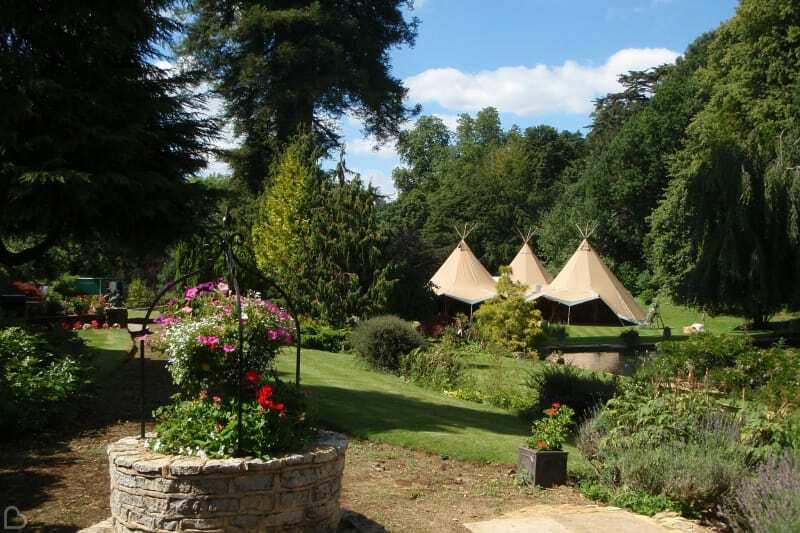 Use the main lawn to erect a tipi for a boho theme, or have an intimate gathering in the secret garden. Whichever you choose, we’re sure this outdoor space will lead to the perfect whimsical wedding! Just a stone’s throw away from Edinburgh, this contemporary sculpture garden is one of the most magical places to be! Jupiter Artland shows off incredible art via the dramatic landscapes of the gardens, meaning you can get wed with an extraordinary outdoor backdrop. 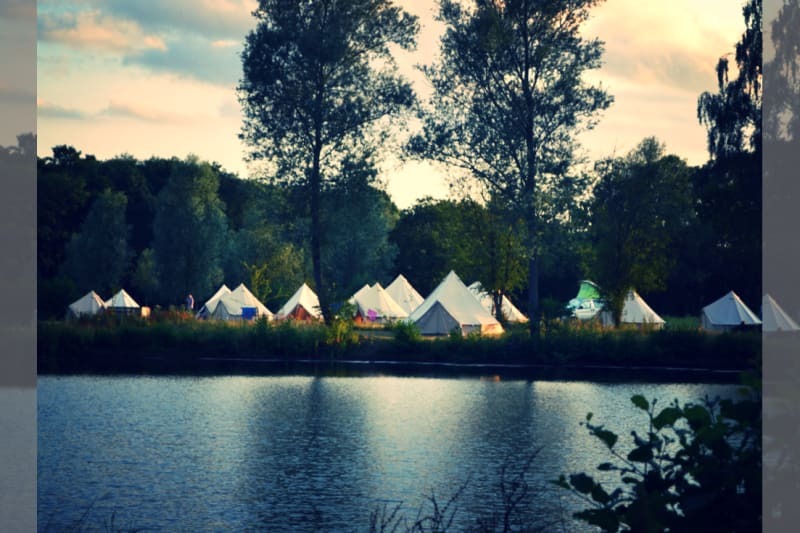 Plan things a little differently with Browning Bros Events – gorgeous lake views and ancient woodland surround the Colne Valley area, where you can pitch a marquee or group of tents to create your own DIY wedding. 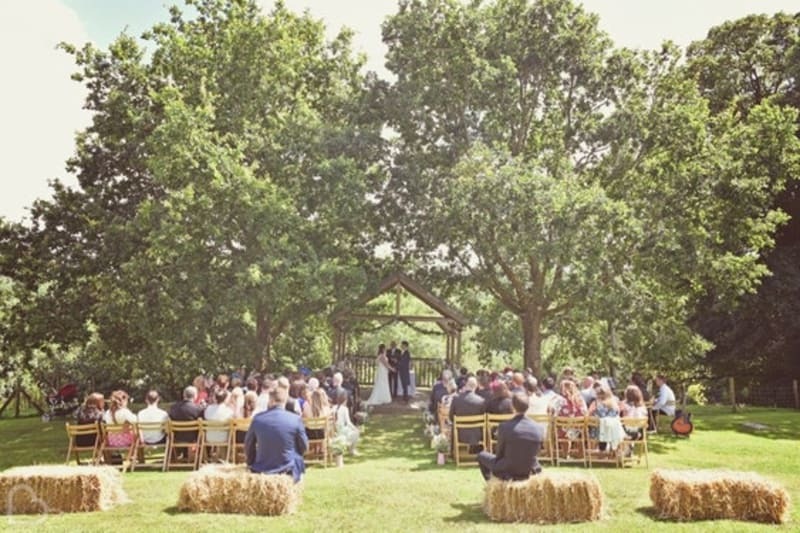 Be at one with nature in this stunning outside wedding venue! Looking for a unique place to get married? Check out some of our favourite unusual wedding venues here! Stourport Manor welcomes you to its 23 acres of lush grounds and contemporary country house setting. Use the patio area as a place to mingle, grab awesome wedding shots within the trees, or even have a barbeque under the stars in this flexible outside wedding venue. The private wedding village that is The Green is encompassed by valleys, rivers and wild meadows – but also houses 5-star luxury accommodation! This 20-acre estate can be all yours for the day, and perhaps you’ll choose to say ‘I do’ under the natural canopy of beautiful trees in this outdoor oasis. Sitting high up over the Sandbanks Peninsula, the magnificent Harbour Heights Hotel certainly has the wow factor. 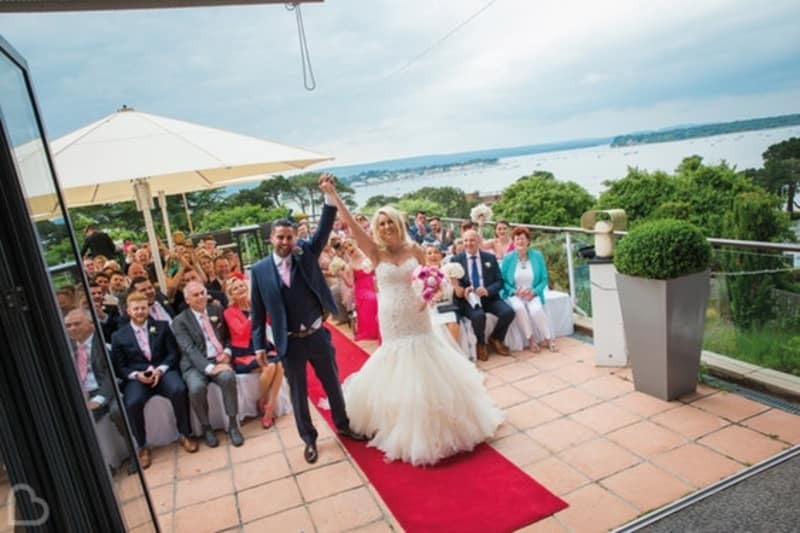 Not only does the stunning outside terrace boast incredible coastline views that your guests will love, but it will also totally make your wedding photographs. 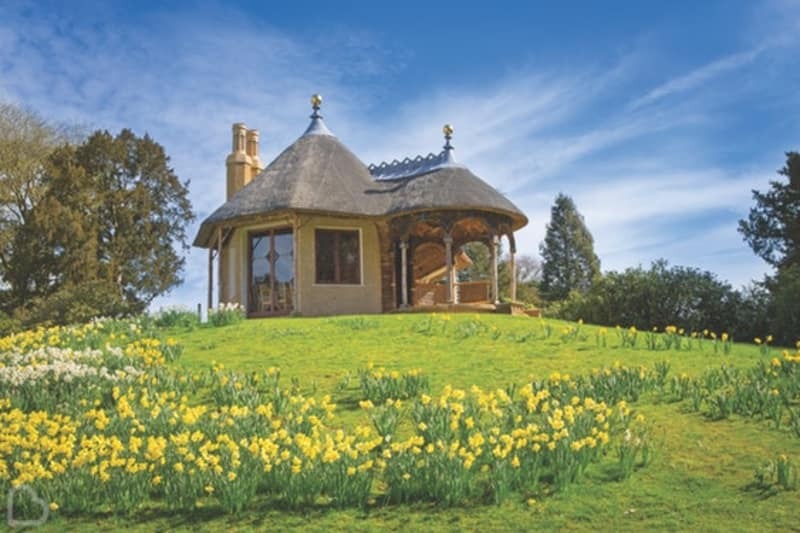 Dating back to 1820, The Swiss Garden at Shuttleworth is a 9-acre setting ideal for magical and fairy-tale weddings. Find your way round winding paths, through floral arches and across vast lawns until you discover the Swiss Cottage (and don’t forget to find the Grotto too!). 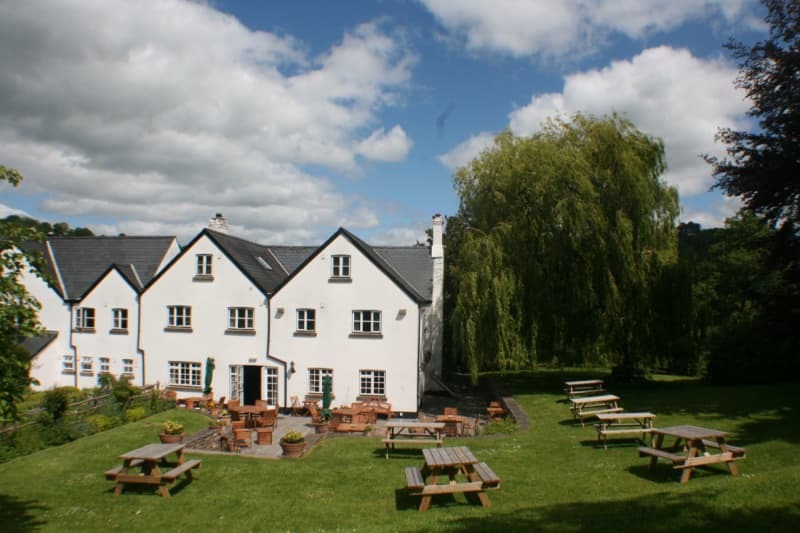 Set on the Llangollen Canal banks, Lion Quays Waterside Resort offers one of the most splendid outdoor ceremony spaces. 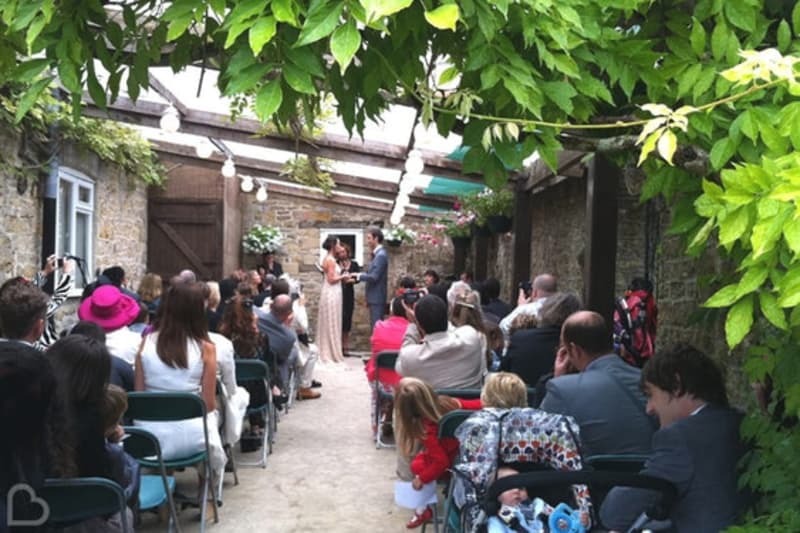 Say your vows while enjoying water views and countryside air, all while in the glorious grounds of the walled garden. What could be more perfect on a spring or summer day? 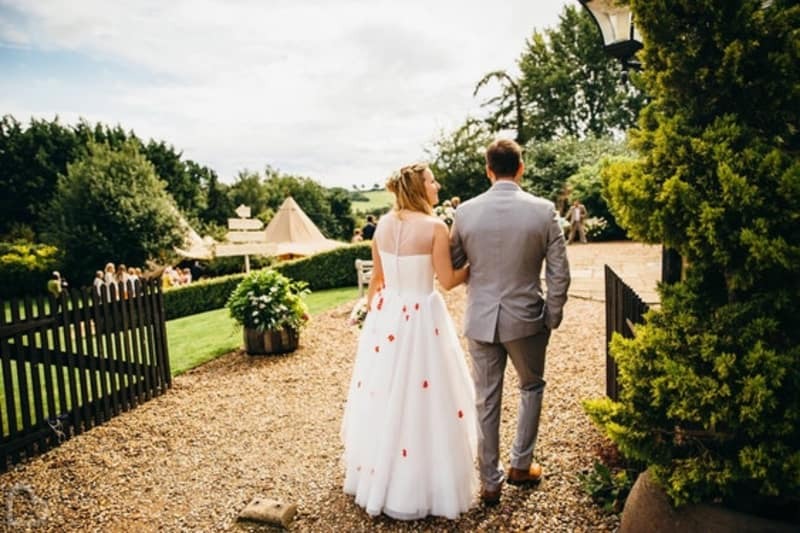 On the grounds of Brook Hall Weddings, you’ll find a 12th Century church building, a rustic barn structure and the main house, not to mention endless parkland. Take your new husband or wife by the hand and go on a romantic walk through the wonderful nature trail. Click here to see our top barn wedding venues in the UK! 600 acres of private estate and historic buildings meet you at the site of Preston Court. 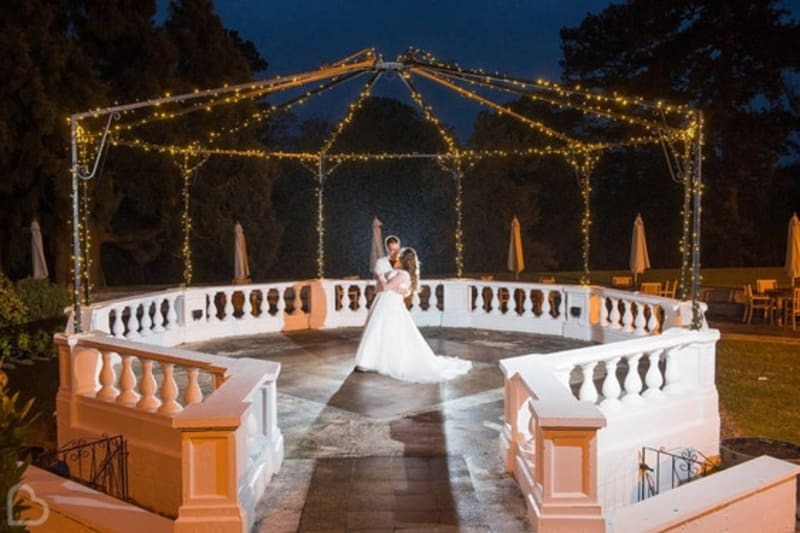 Boasting a Victorian carousel and plenty of space to accommodate a whole host of fun activities, the extensive grounds of this venue are perfect for a playful outdoor wedding! 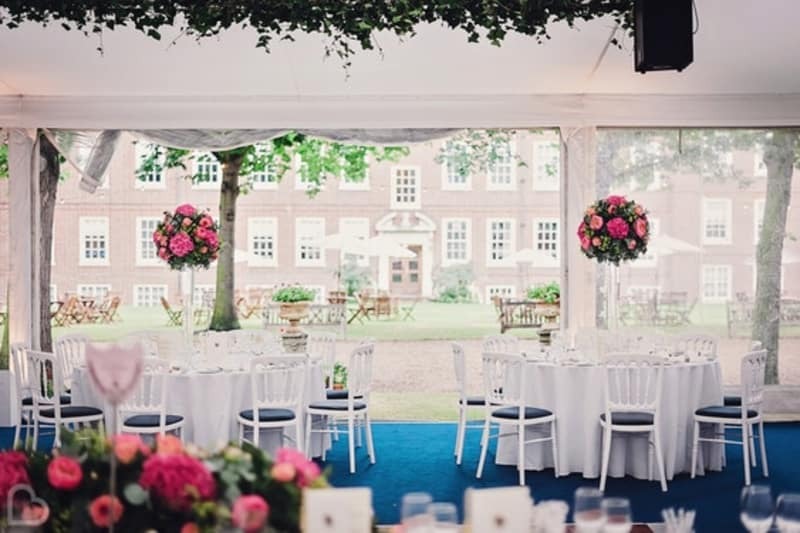 Have your wedding ceremony in the sophisticated Orchardleigh House, or take a step outside and be bold with an alfresco wedding in the Walled Garden, where your guests can mingle across Italian lawns and the beautiful Orangery. Roam the estate like a Lord or Lady for the day! 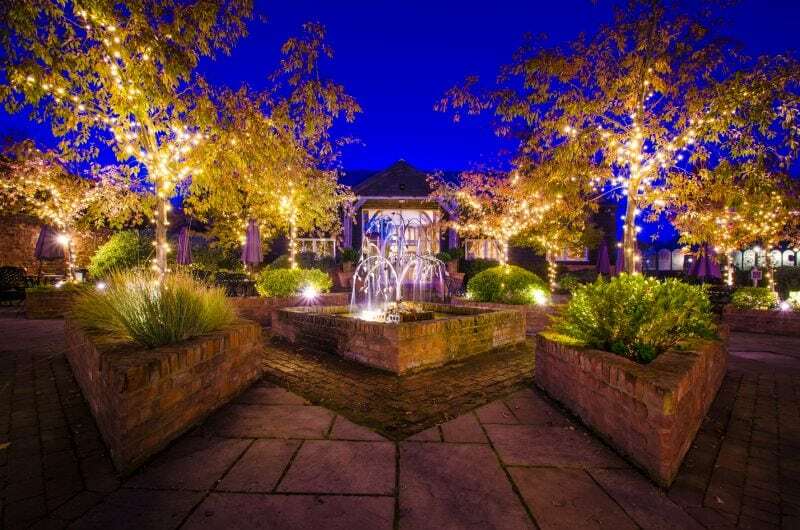 Cosy yet plentiful, Marsham Court Hotel‘s outdoor space is just simply sweet. This private and romantic sun-filled garden offers sea views of Dorset’s coastline and is the ideal place to clink glasses with your guests before continuing with your celebrations. See the best hotel wedding venues in the UK here! Thinking of a laid-back wedding on a summer’s evening? We’ve found the perfect place to do just that! The Barnyard is surrounded by natural woodland, where you can celebrate into the night among the illuminated plants. Get a photo on the romantic wooden bridge too! Maidstone is home to The Orchard, an idyllic setting for a quintessential outdoor celebration. Surrounded by rolling hills and seemingly endless landscape, explore the gorgeous grounds with your loved ones and escape the sun underneath the flower-weaved pagoda. So beautiful! Getting married in Kent? 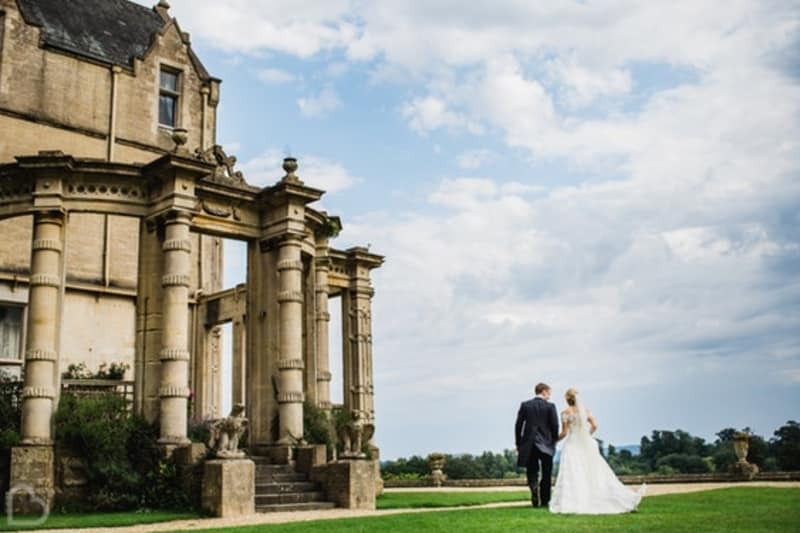 See all of the wedding venues Kent has to offer here! 50 acres of river valley can be exclusively yours at Gants Mill & Gardens. 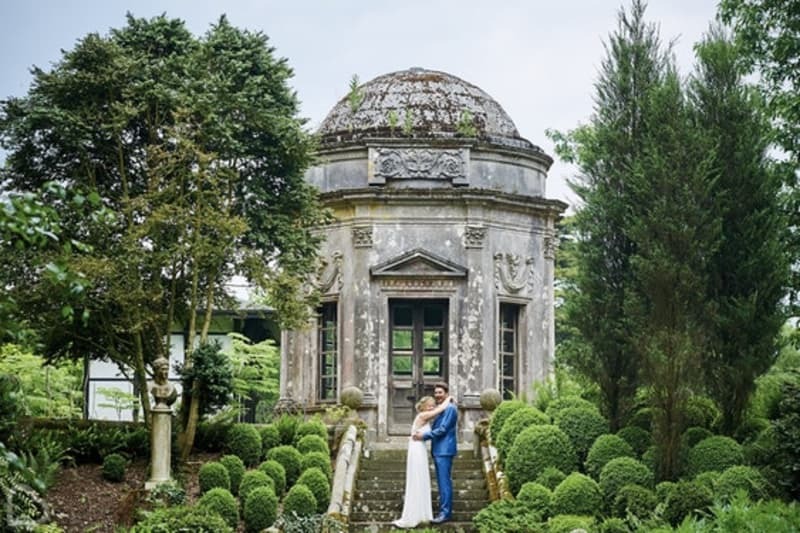 Wander the pretty lawns, outbuildings and gardens at this green paradise, where you can tie the knot in plenty of different settings around the site – in front of the luxury gazebo is one of our favourites! In the heart of the Capital lies The Honourable Society of Gray’s Inn, which not only boasts a magnificent historic interior but some incredible outdoor spaces too. The perfectly preened lawns and stunning gardens offer the ideal place for a private alfresco wedding. 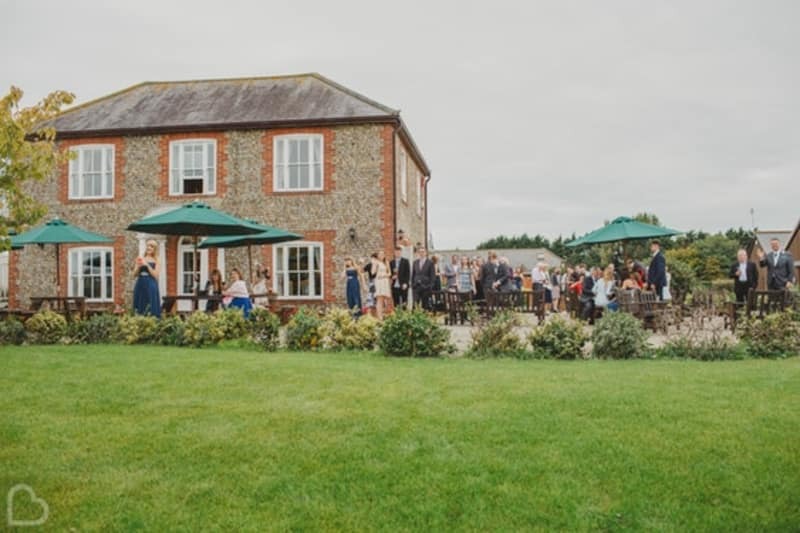 If you’re looking for the perfect place for your guests to gather as they spill out from your ceremony, the terrace and lawns of Chichester Golf Club is the best space. Set up a stunning marquee against the romantic backdrop of this venue and enjoy your celebrations out in the open. 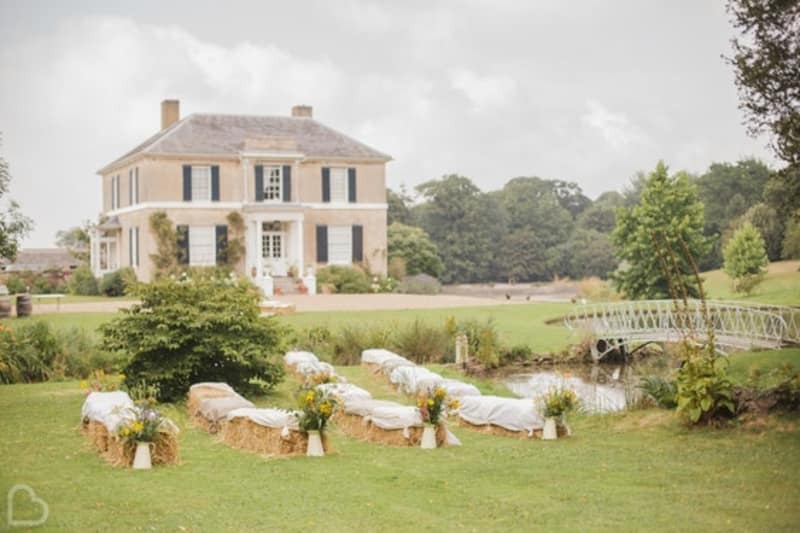 Check out the best UK country wedding venues here! Enjoy dramatic landscapes and amazing countryside views from the balcony at Manor Hill House, a contemporary venue in Worcestershire. Have afternoon tea on the lawns, where there is the perfect space for all of your guests to sit back and relax. 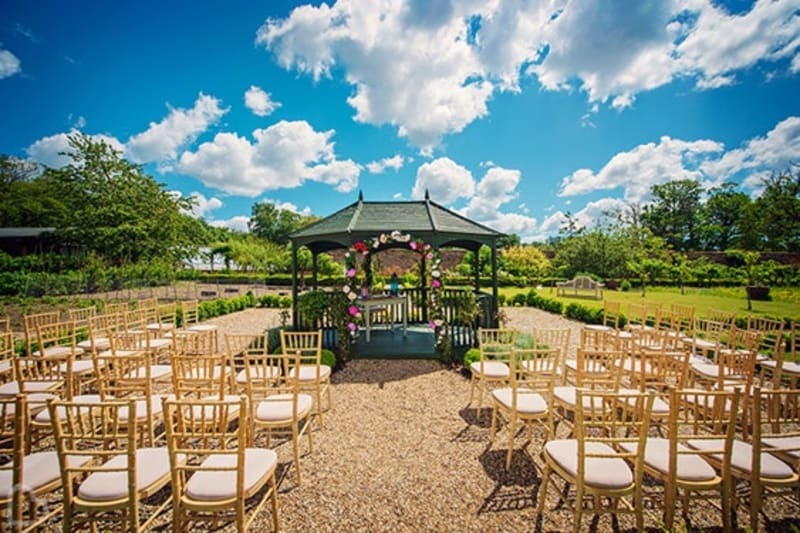 A setting of rolling countryside and beautiful extensive grounds is home to Chafford Park, a venue complete with Georgian splendour. 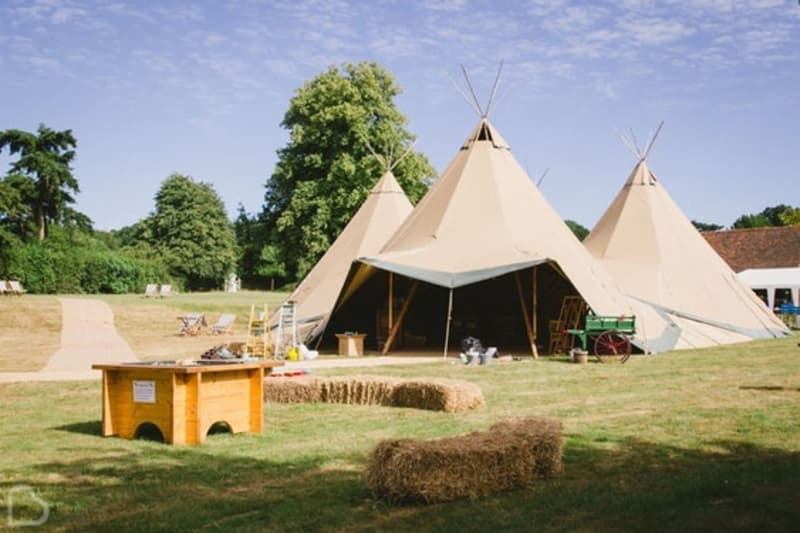 The lawns are the ideal place to host your own DIY wedding – think tipis, garden games and totally brilliant outdoor celebrations! 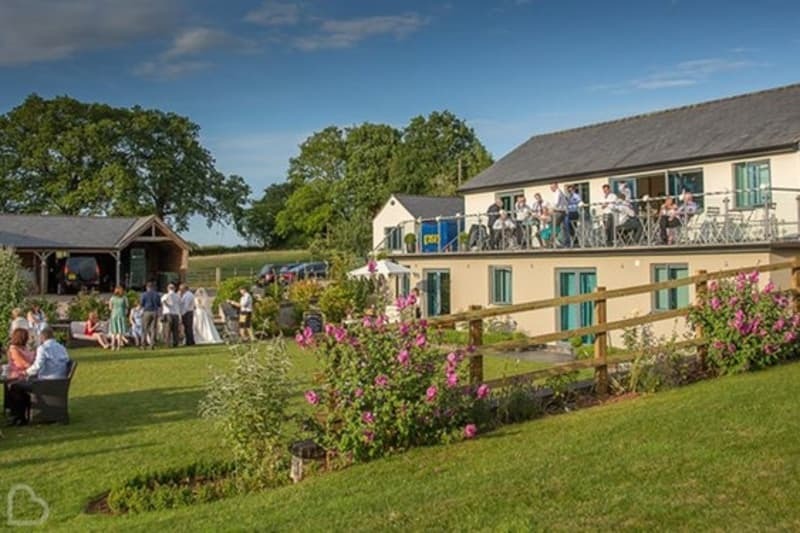 The boutique hotel of The Bell at Skenfrith is a complete Welsh wedding dream – sip your favourite tipples on the country garden terrace surrounded by wonderful trees and lawns, before finishing off the night in a luxury marquee located in this brilliant outdoor space. 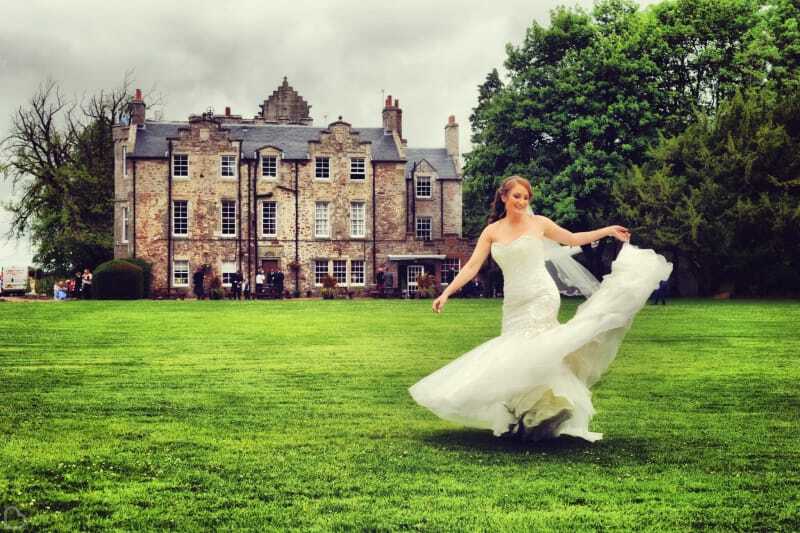 This romantic 12th-century Scottish Castle is absolute dream and its outdoor spaces will surely make your wedding the talk of the town! Located between Edinburgh and Glasgow, Shieldhill Castle sits on 5 acres of peaceful grounds. The venue features an intimate, candle-lit chapel, which means you can tie the knot and enjoy your party, all in the same place! Want to feel like royalty on your wedding day? Check out the best UK castle wedding venues! 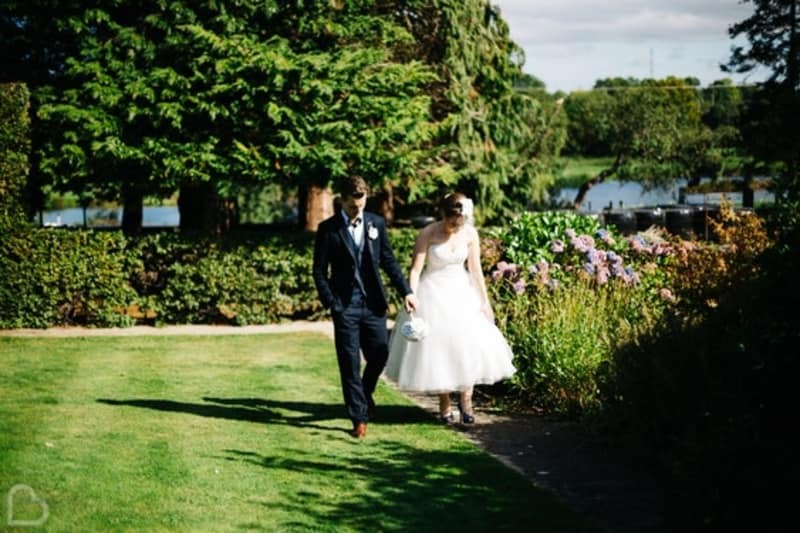 This family-run marquee wedding venue is set on the grounds of a beautiful 2-acre garden which features 3 lakes, all exclusive to you and your guests! One of the most picturesque venues in the UK is the perfect setting for you and your loved ones to enjoy the most important day of your life! 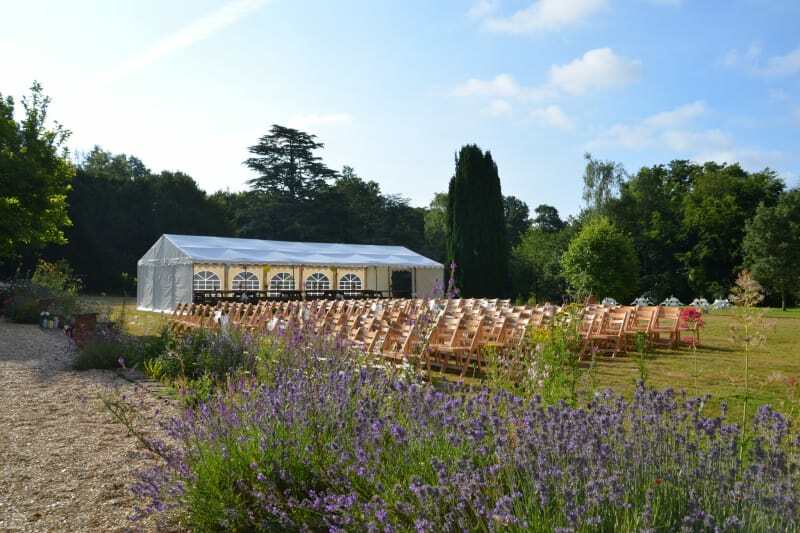 If you want to get married in Surrey, this outdoor wedding venue could be the ideal one for you. Discover 12 acres of enchanted woodland and a gorgeous Georgian house, ideal to spend your wedding day with your loved ones! Rownhams House & Gardens is one of the best outdoor wedding venues in the UK. This romantic gem can host civil ceremonies, wedding breakfasts and evening receptions and it’s all exclusive for you and your guests. Its stunning gardens are the perfect backdrop for your wedding photos and their all-inclusive package will leave you stress-free throughout your wedding planning! 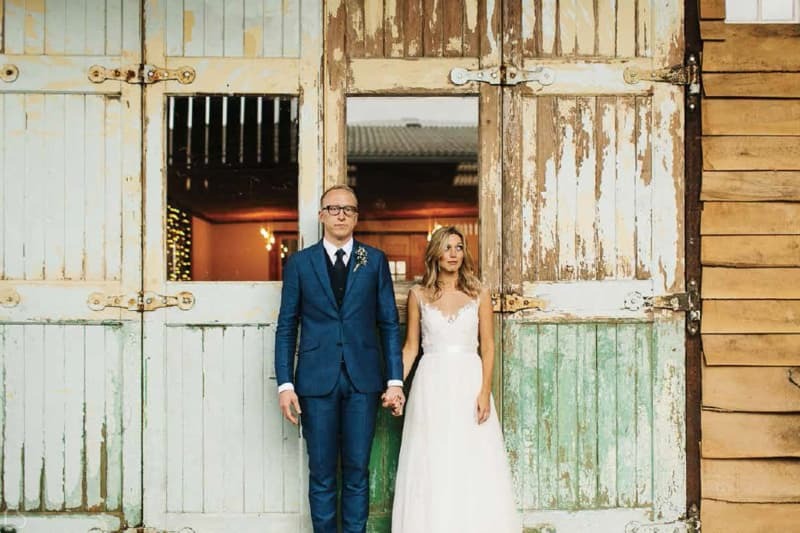 Who doesn’t love a barn wedding? This wedding venue is located at the heart of the Cheshire countryside and promises a unique bespoke experience to whoever chooses it to tie the knot. With undeniable rustic countryside charm, the farm is home to sheep, cattle and even some adorable pygmy goats! Surprise your guests and book your wedding venue in Manchester! 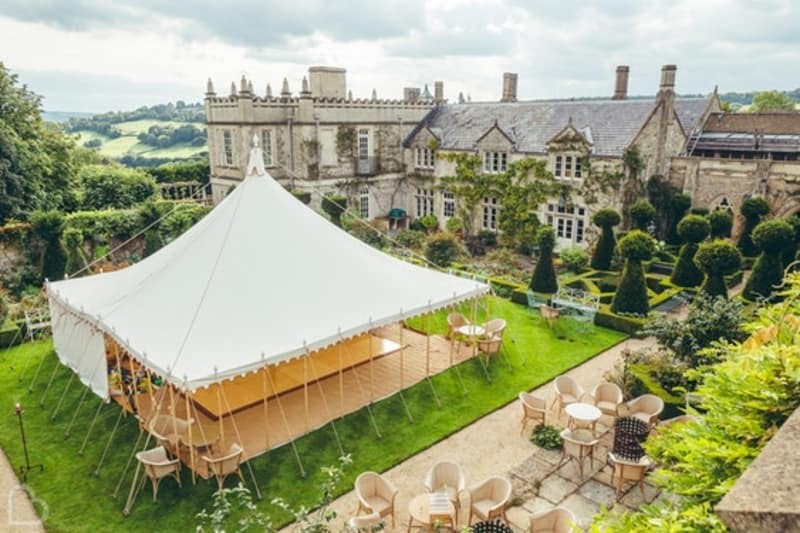 What incredible spaces for alfresco celebrations! 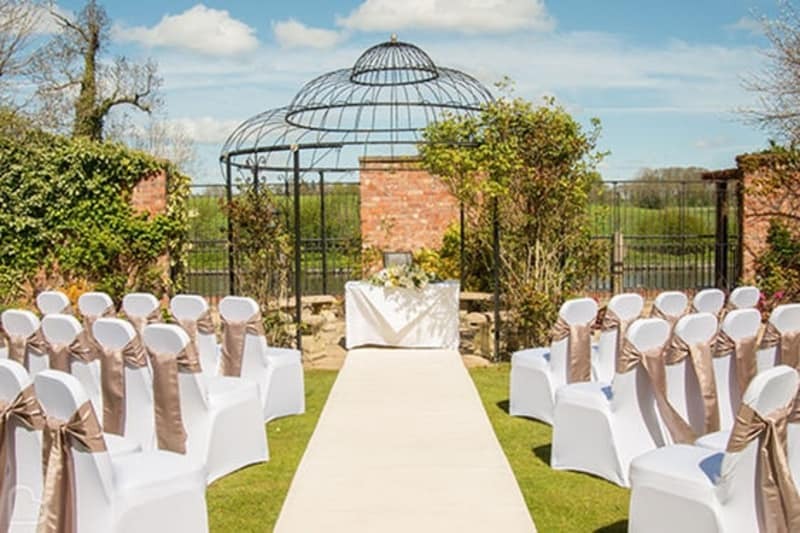 Now, if none of the outdoor wedding venues we featured is the perfect setting for you, start up a Bridebook.co.uk Wedding Venue Search and be sure to use the style filter ‘outdoor space’ for some more wonderful ideas. Don’t forget to use our budget, checklist and guestlist features alongside your search, plus we have some of the best expert advice that you can feast your eyes on. Check it out!